The Summer School registration allows staff to see and manage course and course enrollments. There are two course screens, course details, and course enrollment totals. 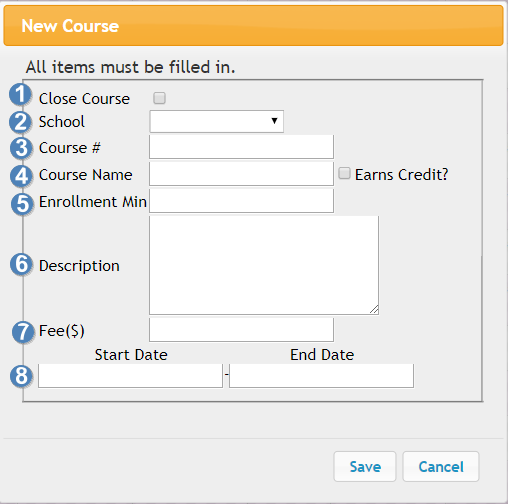 The course details screen allows staff to manage and create courses. The course enrollment screen help for sectioning and section creation in PowerSchool. To get to the student screen log into sr.glenbard.org with an admin account and click Courses from the top menu. Clicking edit or new course will show the following box. The school the course is managed by. The course maybe hosted at another building. The course number of the course. All credit courses need to have an existing course number that matches regular PowerSchool. Any enrichment and bridge must start with EC or BR respectively. Each course number can only have a single fee across the same course number. This has a similar autocomplete as the course number above. The start date will determine which summer school year it belongs to. Changing the date will move the course appropriately. Do NOT reuse last years courses. Do NOT change the start date to move to the new summer school year. When managing courses there are few things to keep in mind. First every year new courses must be made. Do NOT reuse previous year’s courses. Second, there can only be one fee for each course number. Third, use the autocomplete feature to speed up course entry. To get to the student screen log into sr.glenbard.org with an admin account and click Enrollments under the Course menu from the top menu.